Since creating the dystopian classic Brazil in 1985, Terry Gilliam has directed just eight more features—a disappointing total for such a feverish imagination. And those films have frequently been half-cocked or messed up, as though damaged in transit. His newest is signature Gilliam: visually exuberant and robustly cynical, it shows the director still circling the big ideas he’s been nursing since his Monty Python days. Pat Rushin’s futuristic script is draped around the defeated shoulders of a worker drone named Qohen Leth (Christoph Waltz). Convinced he is dying, he pesters his manager (David Thewlis) to be allowed to work—Qohen inputs “entities” into a fearsomely complicated database—at home. 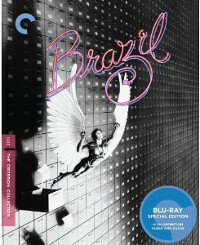 Terry Gilliam’s Brazil (Criterion), a dark, dense science fiction fantasy, is like “1984” rewritten by Monty Python, an absurdist nightmare of Kafka-esque dimensions. Jonathan Pryce is the dreamer trapped as a worker bee in the bureaucratic maze as deadly as it is indifferent, until he falls in love with a woman (Kim Greist) he thinks may belong to the terrorist underground. The road to true love involves lunches with his plastic surgery-addicted mother (Katherine Helmond), bureaucratic dueling with an air condition repairman (Bob Hoskins), and cozy relations with the friendly neighborhood interrogator (Michael Palin). Fittingly the film took its own circuitous route to release. Universal stalled the release and even reedited the film, until Gilliam screened the film himself for the Los Angeles film critics, who championed the film and lavished it with end of the year awards. Universal released the 132 minute theatrical cut of the film, the same one that played theaters in the U.S., on Blu-ray last year in a bare-bones edition. But well over a decade ago, Criterion released Gilliam’s definitive version of the film, culled from materials in numerous different release cuts, in a deluxe three-disc DVD set packed with supplements. That edition now debuts in a newly-mastered, Director Approved Blu-ray set. We sometimes say that comedy is a very serious business, and we’re right; but that doesn’t mean it shouldn’t make us laugh. Comedy is serious when it makes us laugh in an important way, at something—whether big or dangerous or overrated—with which we can deal more easily once we’ve laughed. Annie Hall brought humor out of things that cause people great pain, and those who love the movie seem to value their laughter very highly, as a kind of liberation: as a friend put it, “Annie Hall may do for neurotics what Rocky did for everybody else.” But the laughter is crucial, and unfunny comedy is just depressing. 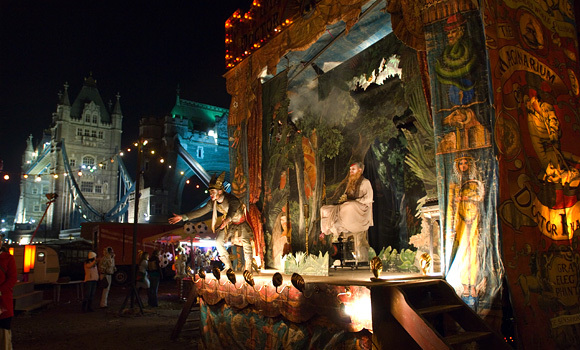 In Jabberwocky, for instance, we may be taken with the way Terry Gilliam has cast an attack by medieval dragon in the first-person mode of Jaws and King Kong—complete with tuneless, throbbing background music—or with his satiric images of life in the Middle Ages, which look like the work of a wicked 19th-century cartoonist. We may laugh in spite of ourselves the first time the innocent-abroad hero, Dennis Cooper (Michael Palin), is accidentally peed upon—likewise when garbage is thrown on him or he falls into a manure pile—but it’s hard to laugh the second or third times: we can take only so much offal humor at a sitting. Cooper’s grotesquely fat lady love Griselda, sitting on her lake porch munching placidly on a raw potato, may strike us as a marvelous creation, until we realize how little will be done with her; that first glimpse contains everything we’re given to laugh at through every one of her appearances.